Consisting of curving pipes and 35 interlocking aluminum panels suggestive of a riverscape, the sculpture is “a meditation on the Hudson River,” Glassman told Cultural Weekly, a digital magazine based in Los Angeles where Stephen Glassman Studio is located. In his interview, Glassman recalled the relationship between Flows Two Ways and the VIA 57 West residential high-rise with its unobstructed views of the Hudson River waterfront and park. As the first major commission in the U.S. for the Copenhagen-based Bjarke Ingels Group (BIG), the pyramidal shaped VIA 57 West represented “a radical departure from the apartment block typology,” according to Architectural Record. 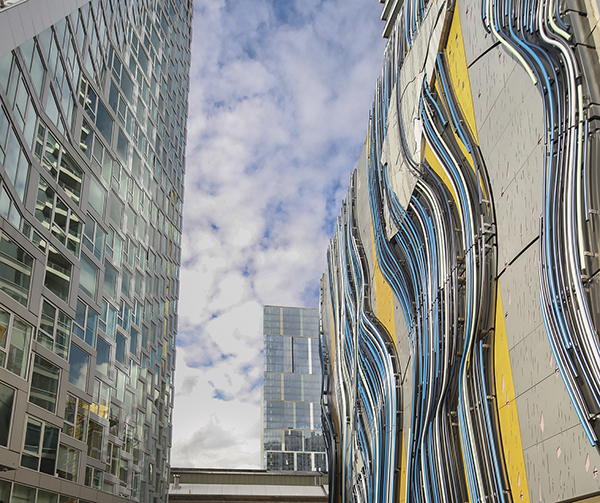 Standing at the entrance to VIA 57 West, the Flows Two Ways sculpture represents “one of the most innovative new public art wall projects in New York,” The Architect’s Newspaper acknowledged. 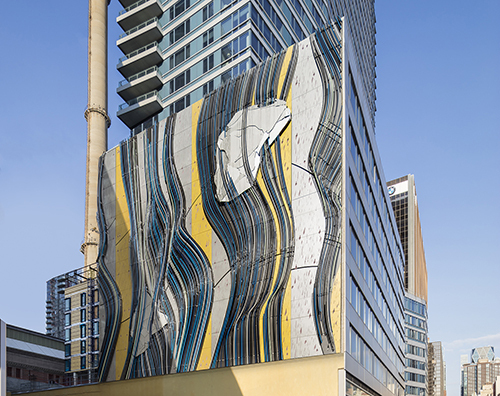 The 16-ton layered sculpture is secured by a stainless-steel mounting system into the wall of the Helena 57 West, a 38-story residential tower that fronts the entrance to the VIA high-rise. The sculpture’s 400 pipe clusters were powder-coated using an assortment of colors related to studies by the Hudson River School of painting. A search for metallic coatings to be used on the sculpture’s aluminum panels led Glassman Studio to Dustin Kaatz of TPC Consultants, Inc., in southern California, who recommended an ultra-durable fluoropolymer coating system from Tnemec. Assisted by Kaatz and Tnemec coating consultants Michelle Call, Carl Bowers and Phil Gonnella, the project director for Glassman Studio was referred to projects in several cities where Series 1078 Fluoronar Metallic fluoropolymer coatings in various gold colors were used. 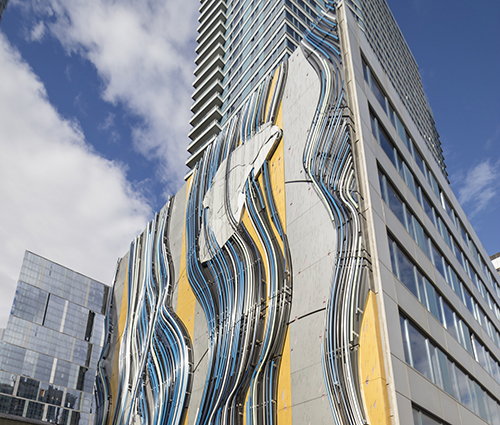 “The Glassman Studio team flew out to each location to inspect the projects before deciding on a custom metallic color called City Creek Gold, which was used on Zion Cooperative Mercantile Institution (ZCMI) project in Salt Lake City, Utah. Series 1078 Fluoronar Metallic Platinum and Bright Aluminum colors were also selected for the sculpture. The metallic fluoropolymer coating system was applied by Atlantic Coast Metalizing Coatings Corp. in Melville, New York. The panels were blasted and primed with an epoxy coating prior to receiving a finish coat of Fluoronar Metallic. An aliphatic acrylic polyurethane clear coat was applied over the finish coat to extend the long-term weathering qualities of the metallic pigmented coatings. Pieces that required two metallic colors on the same panel as part of the design were masked off by Glassman Studio prior to coating. VIA 57 West has won numerous architecture and design awards including the 2017 AIA Housing Award, the 2017 ACEC Excellence in Engineering National Award, the 2017 Architect Magazine Residential Architect Design Award and the 2016 International Highrise Award. Other prestigious honors received by VIA 57 West include 2016 Tall Buildings Award in the Americas category from The Council of Tall Buildings and Urban Habitat and 2016 Society of American Registered Architects Special Award for Excellence in Residential Design Innovation. The Flows Two Ways project was a winner in the 2017 Durability + Design magazine’s Elevation Awards in the Distinguished Residential Exteriors category.